Outlined below is a brief history of the 1960’s E-Series Pickup made by Ford. You will find our sources at the bottom of the page, as well as a comments section to leave any remarks, correction or other questions. The European inspired cab over Econoline Pickup came on the heels of the popular Volkswagen Transporter Van. Although the design was not unique, its use with a truck concept afforded for a long bed along with a roomy cab all while maintaining an overall compact size. By sharing the cab with the engine and placing a 165 pound weight in the rear for balance, Ford was able to achieve a truly economical and iconic design. Although the Ford E-Series trucks were an immediate success when they were launched in 1961; they were the least popular of 3 truck lines Ford was producing, marketing and selling at the time. Both the mid-range F-Series and heavy duty C-Series trucks outperformed the E-Series pickups. 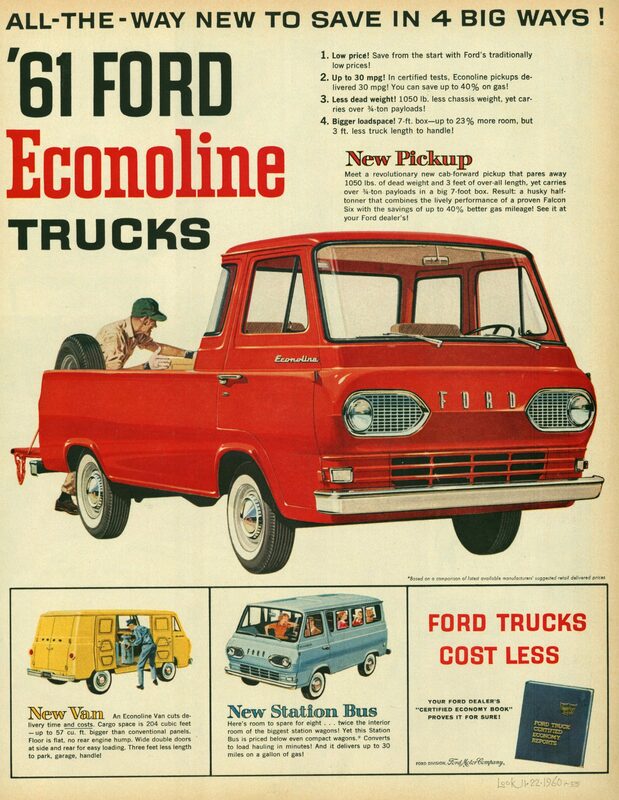 However, the niche that the Econoline pickups held was popular among light duty commercial and utility businesses such as telephone service providers, farmers and delivery services among other applications. Primary reasons for the Econoline pickup’s popularity in these sectors were due to the following key features. In 1961 all models were equipped with an 85 horsepower six-cylinder (144 CID) engine and 3-speed manual transmission. Other key construction features for this first year include the following. From 1962 to 1967 several changes and options were provided for the Econoline pickup. Some of these features and additions are detailed below. In 1963 a heavy-duty package was offered that included: reinforced frame, stiffer springs, 14 inch wheels and tires, stronger rear axle. In 1967 a dual brake master cylinder, padded sun visors, two speed windshield wipers and back up lights were offered. The first year (1961) 14,893 pickups were made which included nearly 12K standard and 3K custom models. With 11K made in 1963 and dipping to under 3,000 units for 1966 and 1967 the Ford Econoline Pickup demonstrated falling sales throughout its lifespan. There are several reasons for the decline of the Econoline pickup. The primary one however was competition; both internal and external. 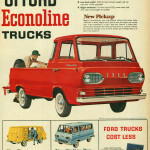 Not only was the Econoline pickup just one of three Ford trucks but it competed in the same space as Chevrolet/GMC, Willys and Dodge (particularly the Dodge A100) along with international competitors such as Volkswagen. 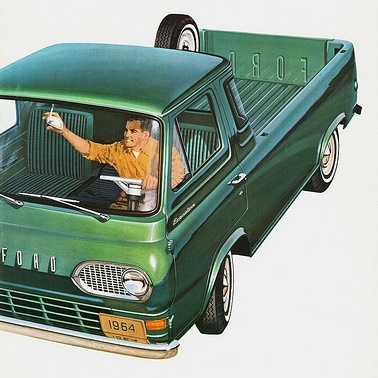 The niche market space along with the introduction of Japanese small pickup sales in the west led to the Ford Econoline Pickup’s discontinuation in 1967. Despite only being offered for a short 7 year period in the 1960s, the Ford Econoline Pickup remains an iconic and collectible truck today. It is a highly sought after pickup by collectors and enthusiasts alike. Restorations and custom rebuilds are popular with these early model E-Series trucks and vans. 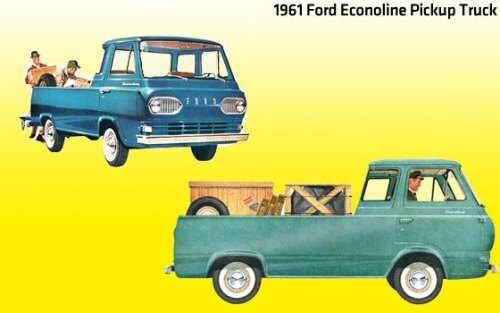 How many 1962 econoline pickups were produced. I can’t find the production numbers.